The Young People’s Project (YPP) is an outgrowth of the Algebra Project, “a national mathematics literacy effort aimed at helping low income students and students of color successfully acquire mathematical skills that are a prerequisite for a college preparatory mathematics sequence in high school and full citizenship in today’s technological society.” YPP joins the Algebra Project in its belief that all the children who live in the country are children of the country and that they have the right to a high quality public school education. YPP has developed a pipeline for young people to invest in themselves, each other, and their communities, as well as platforms to harness the power of their culture to promote and value, those things required for individual and community success and well being. These platforms also serve as a way for our members to support, challenge, and demand the just and effective functioning of institutions and systems, theoretically created to serve their families and communities. At each site YPP conducts on going training and development of all of its current and incoming Math Literacy Workers. This training model was developed in part by the support of multi-year grant from the National Science Foundation - Division of Informal Math and Science Learning and a cohort of National YPP and AP trainers. At each site, teams of high school math literacy workers (MLWs), lead by a college math literacy worker (CMLW), conduct workshops for students in grades K-8. These workshops take place at various outreach sites, comprised of afterschool programs, churches and community centers. Workshops are organized around math-based games and collective experiences, and emphasize individual reflection, small group work, teamwork and discussion. The implementation of these workshops, along with community events, are central to the growth of math literacy workers, supporting their academic and social development, and their emerging identity as catalysts for helping family community members to understand that success in math is important and attainable for all children. YPP seeks to create a space within the neighborhoods we work for young people, their parents and community members to come together and learn mathematics. By going into their communities and facilitating workshop and events, high school students have an opportunity to share their skills with their peers and community members. As a result, young people are engaged in a cycle of learning which supports their personal development while involving them in a wealth of experiences that broadens their perspective on how they can impact their community. We see this as the catalyst to developing a cycle in which MLWs work to build a critical mass of young people and parents in their communities who take responsibility for their education and work to insure that younger community members have the drive, skills and work habits that will allow them to develop to their full potential. Teen STEAM Days are a day of fun and educational workshops which provide a hands on preview into S.T.E.A.M. related skills and career paths for Math Literacy Workers. At STEAM days, high school students are introduced to an innovation/STEAM competency, such as a Coding 101, through a creative hands on activity. 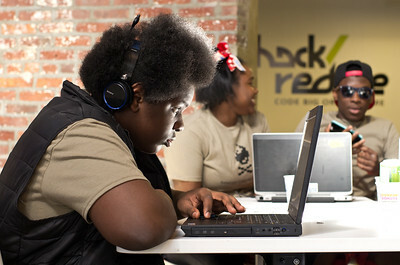 Math and Coding programs seek to integrate YPP's traditional mathematics literacy curriculum and with emerging computer programming skill sets.